We are always more than happy to review products or a business that our community of moms should know about. We ask that if you have something for one of our mom bloggers to review, that you send us a complimentary product, a trial membership or class to review. For reviews of products only (no giveaway product offered) we charge $30 for a minimum of 200 word review (though it could be more) complete with a link to your website (additional links have a cost of $5 per link). For reviews which also include a giveaway for our mommy fans there is no charge for the review. We will work with each business to select methods of entry for the giveaway which benefit the sponsor business (website visits, twitter follows, Instagram, etc). Our group of Cape Cod Mom Bloggers enjoys reviewing products. All claims made by the Company (sponsoring the Giveaway or Company who owns the product) and their website or business belong only to that company. Mommies LLC is in no way liable for claims made by other companies and businesses. Claims made by Companies/Products/ or Small Businesses listed on our blog are not necessarily the view of the blog owner, author's, or advisors unless specifically stated otherwise. We will always give our honest and fair opinion of a product and the opinion's belong to the blog author and disclosure will be made on post regarding any exchange of goods/services. Cape Cod Moms will always keep the product reviewed unless otherwise negotiated. At Mommies LLC discretion, the product may be given to a local family that is in need in our community. Mommies LLC reserves all rights to determine who receives a donated product. Depending on the product we will typically post a review of it within a month. If we have a concern with the product we will address it first with sponsor prior to publication. All product reviews are fair, unbiased and honest. If something seems defective or irregular about the product being reviewed, Cape Cod Moms will contact you before writing and posting a negative review. While we do not intend to publish negative reviews, we will discuss with the proprietor prior to publication in an effort to keep communication open and honest. We do however pride ourselves on transparency and open communication with our readers. Reviews that include giveaways tend to get more reader response. 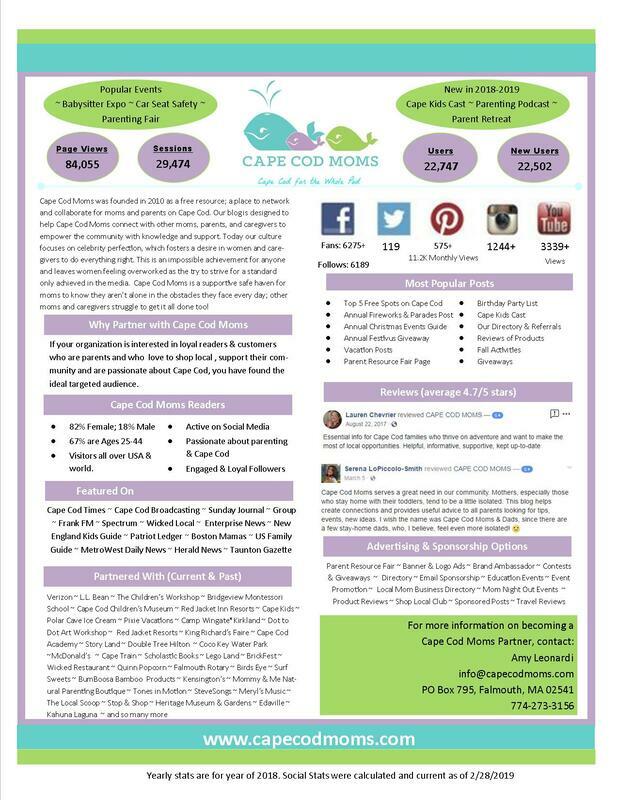 If you would like Cape Cod Moms to feature a giveaway with the review then we will work out details of entries and prize fulfillment before publication.